Valentine's Day... It's a love/hate thing for me. Love the plethora of hearts. Love the romance. Love the Valentine's Day parties. What do I hate? The candy! Some candy is fine (preferably a smooth dark chocolate), but a bag full of processed sugar? Add in two small boys... Eh, no thanks. I know I can't prevent it, but this year I decided not to join the sugar brigade. it even stands up by itself! Free Download! It should go without saying that I am not a graphic artist. However if you would like to download this very simple valentine, you can do so here. ties, tape, twine... anything to tie the top. 1. 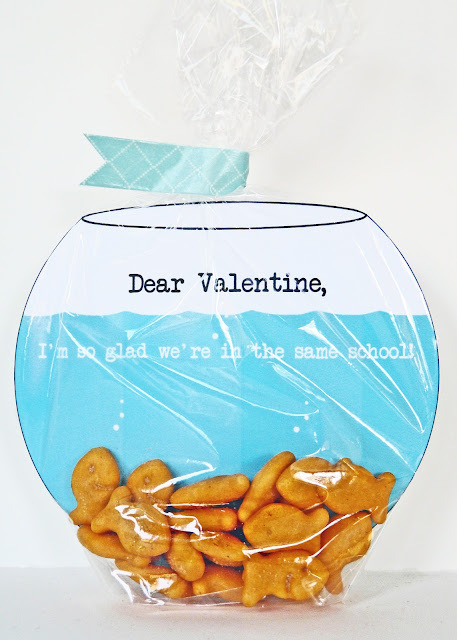 Download, print on photo paper and cut out your fishbowl cards. 2. Have your child sign their name above the bubbles. Or, if you use washi tape to seal the bag, you can write their name there. 3. Insert the card into the plastic bag. I chose to use sandwich bags over cellophane. Besides being cheaper, they are softer and curve around the "bowl" better. They also have a little depth so they can stand up on their own once filled with crackers. 4. Fold the bottom corners of the bag so that it curves around the bowl. Tape the corners to the back of the card with scotch tape. Leave a little wiggle room for the crackers. 5. Pour in the gold fish. I used the pepperidge farm "baby" goldfish crackers which I found at Target for less than $2/bag. They are a little smaller than the regular goldfish, but not much. If you can't find the babies, just get the regular ones. 6. Tie off the bags. I used washi tape. That's it!